Have you ever noticed how sweet Raphael is? Even though he's always acting so hot headed, we know under underneath that shell, he's a real softy. Your little ninja can look just like the tough but sensitive turtle in this Raphael Costume, from the hit Teenage Mutant Ninja Turtles cartoon on Nickelodeon! Out of the four Ninja Turtle brothers, Raphael is the one that fights with the most heart. That's not to say he doesn't think before he jumps into action (well, not all the time, anyway), though he is usually the first one to get into a fight. Like most siblings, he gets a kick out of teasing and playing jokes on his brothers, especially Leonardo. But he would do anything to protect them if they were in trouble, which is pretty sweet of him. We probably wouldn't call the real Raph "sweet" to his face, or he'd get all steamed up and storm away, but when your little buddy is dressed up as him, you can call him sweet all you want! Since Raphael just needs to bring his attitude to win a fight, he doesn't dress that much differently than the other Turtles, but there are a couple differences. This bright green jumpsuit has built in pads, along with a matching green cap with Raph's eyes and distinct red eye mask sewn in. 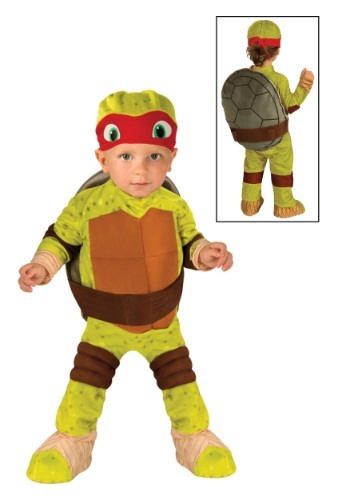 Your little one will also look totally rad with the included stuffed turtle shell on their back. They'll have a blast playing Ninja Turtles with their friends, or you can team up with them and eat some pizza in a radical TMNT adult sized costume of your own! Turtle Power! My 2 year old son loved this costume, it was a hit.